Glad you still got a good clinic in. Sonny dropped his halo big time yesterday. I had them together in Andi,s paddock they were playing nice. I left them together when we went to get the fence panels to make the third area bigger. I got Andi back but Sonny got thru. Stupid me I has not shut gate into third area now open at the back adding panels. Sonny took off like a bat out of hell at a dead gallop thru the gate thru that third area and right out the back of it. I regularly let him loose around when I'm doing things to eat grass in different places around BUT hes got a halter and 12 ft rope on. Andi was having a complete meltdown over all this. I was worried her commotion would set him up for a carry on but thankfully it didn't. Round pens on the hill and played a bit later in the small cavaketti pen. He did redeem himself a bit being wonderful at liberty. It just goes to show as good angels they are... Sometimes the halo does SLIP. I love reading what everyone is getting up to and I’m in awe of some of your hours and miles! I’ve decided if this thread is running next year I will be contributing, Belle and I are having a great time at the new yard, my brave pants seem to be firmly welded to my bum just now and I feel like we could literally do anything, although with both mine and Belles health limitations we might have to give Badminton a miss. I thought about you guys this morning while we were hacking through some woods, I only wish I thought about taking ear pics for you all. Looking forward to hearing more about your adventures. I try and take a photo every week for the thread and looking back through the photos reminds me what I have done in the year. You don't have to wait til next year. Well I've said before I have lost track on my hours but still like posting here. 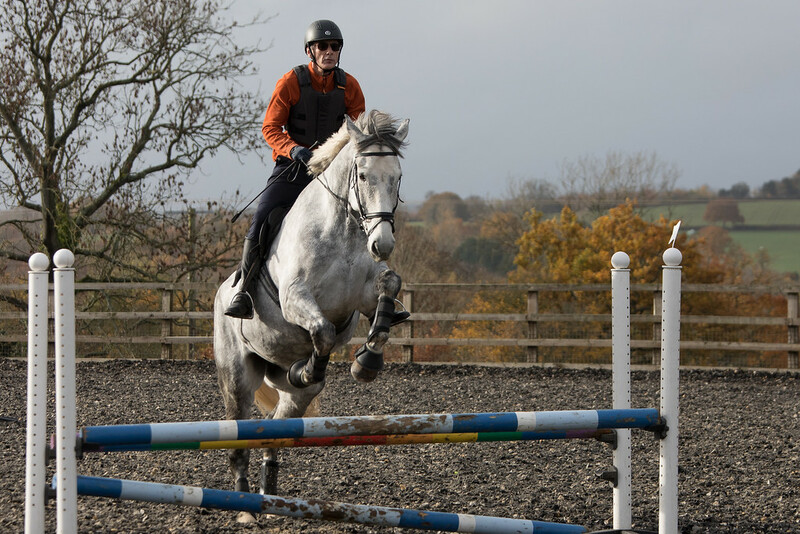 So pleased to report after my disasterous dismount from Zi over a week ago (weather just wasn't conducive to riding at all until last Friday) I managed a nice sedate walk on him - even though he was quite on his toes (pheasants and neighburing farmer complete with dog and stick for said dog to chase lol). I kept it short and then Mr T got on. Was quite funny actually as farmer came over for a natter and thought Zi has chucked me off! I must have done my dismount slither !!! Hahaha can you imagine?! He was worried he had caused me to get off - I assured him it was just so Mr T could get on. The weather is becoming challenging as it always does up here around this time of year - everyone seems sharper, even in hand on the ground! Lol it's nice he was concerned. Had very little play with all the rain and wind. I though at first the other composite might be ok but was too wide sitting too low once I got on and if it does not work for both of us it does not work for EITHER OF US. 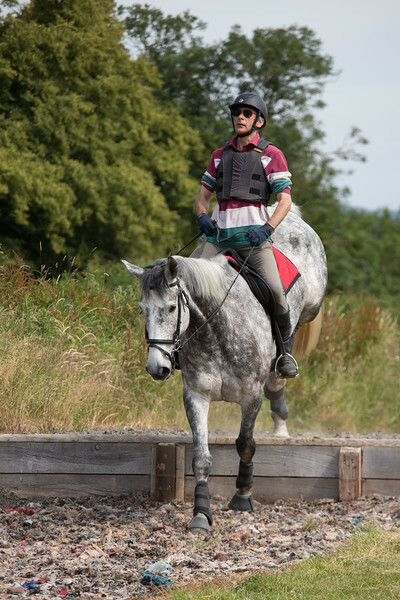 I rode with my barrel saddle I have ridden that a lot before but wanted to make sure.. It was a bit nerve wracking right from the start. Sonny is behind the house loose ( with halter and rope) while im getting one of the English from the basement. I'm just grabbing a saddle off the rack. I rush up and Sonny still standing there as nice as pie nibbling paying no attention and more shots.. I quickly tried both English knowing what outcome would be. Then I saddled with the third the western . I only had to get on to realize it was a no go. So then I changed saddles to the barrel saddle thanfully for once it was not really windy. The wind has been horrible lately and we don't get rain showers either lately geesh we get 2-3 inches at a time ... THANK GOD WE HAVE GOOD DRAINIAGE . The shooting had gone on for a bit then seemed to stop but I was stil a bit on edge. The other day he did the same thing a bit of a lull then lots more shooting again. The saddle was still good for both of us . I heard from Toni she is trying to set up a lesson for next Thurs but an hour earlier with the time change having happened last weekend.that would put me at 1pm. Virgina would like to get a lesson for her grand daughter the day after Thanksgiving.. a Friday. So if it works out we may have a lesson then too. The day after Thanksgiving is called black Friday and kind of official start to xmas shopping. All the stores have black Friday salnnyes and open at 6am and the whole world seems to be on the road trying to get into a MALL (NOT ME) . Lynn may not be available for lessons that day its a 4 day weekend for lots of people having company etc as well. The keeper barrel saddle . Good footing even with all the rain. Andi can get annoying to Sonny.... she constantly pesters him. We are due more heavy rain and wind again tonite. @horseandgoatmom sorry you have wind and rain due. Well pleased to report two more wibble-less (almost) rides on Zi. It has helped loads not being so windy today and yesterday. He doesn't bother at all, it's me, I just convince myself he's going to spook etc. A strange experience for me - a weekend with no hacking! On Monday the lorry came back with a new floor (and a bill for £475) so we were all set for the weekend. Saturday was a SJ clinic with my yard owner at a local facility. After an initial issue with the lorry partition refusing to close it all went quite well. 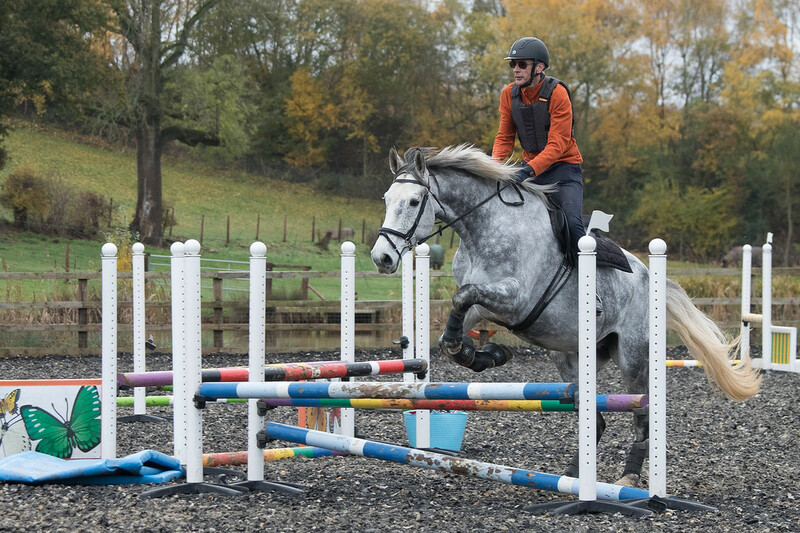 Harvey jumped well for me with us both continuing to improve although I got lost (again ) when we jumped the full course. 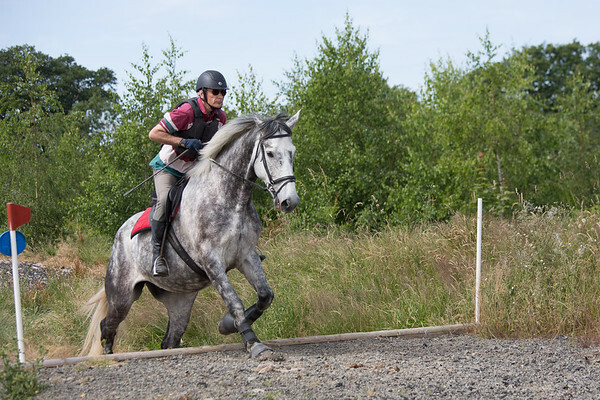 Sunday was an Arena Eventing clinic. This was supposed to be using the school and a specially designed track with the XC fences. Sadly work on the school surface wasn't complete so we had to do most of the session in a different school. We started with a course walk, then fetched the horses and rode the course in parts, and finally rode the full course. I managed to ride the full course without getting lost (yey!). 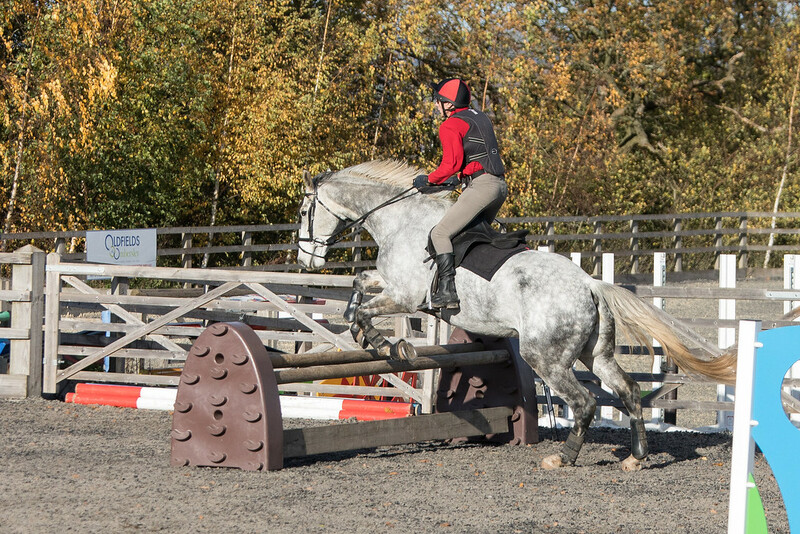 Sadly it was a bit small for us it was supposed to be 70cm (which I had booked as Harvey can be a bit mad XC) but it was nearer 60cm, apart from the full round when it was put up to 70cm and one at 80cm. 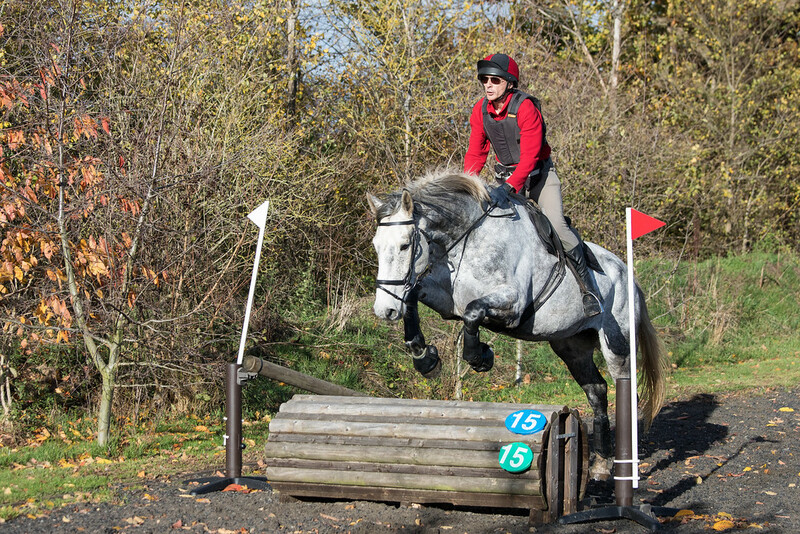 We finished off by going round to the Arena Eventing track and having a play in the water and jumping one of the XC fences. I really like that last obstacle of a hill with a small drop off. 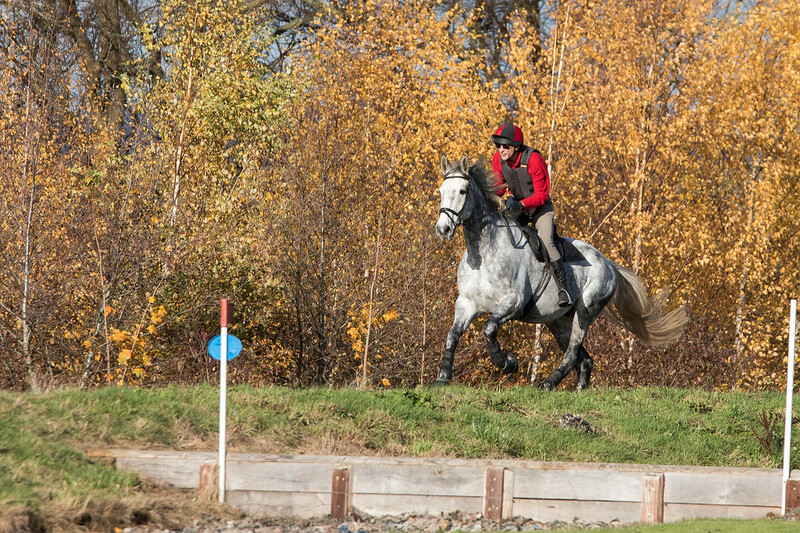 There is a big eventing place with several courses near the old house. They had a drop down as tall as me .. I had gone to watch and got positioned to see that drop off. Omg that was scary to watch . We had reallyt heavy rain Fri into sat but woo hoo cleared before he was here. The wind was really horribly bad though. The adjustment went well he was a little crooked and had a bit of hind end weakness and muscle loss but more work will help that. NO MORE HANGING IN FRONT OF THE FAN ALL SUMMER !! The saddle sat level and just needed to come up totally a little . That half pad was a bit too thick so Saturday nite I got a different one with shims. I've done a lot of play the last few days . After Dr Katz left I tried to do a bit of liberty but the wind was just too bad for that so I did more traditional on line in my little arena and that went well. I have done a combo of both online and liberty the last few days and I can see a difference in him already. We have been very windy so I have not ridden. Its horrible today a couple inches of rain already and its far from done. that will turn to rain in the evening. So im not sure if it will happen. Goodness - you aren't having much luck with the weather at the moment! Zi's halo clanged onto the floor loudly today. I have a number of things I can try with him. Hopefully I'll be able to report back and join in again on here soon! But after today I think it may take a while. Thought it was too good to be true how he had settled so nicely. Hmm. Maybe it is just winter coming - either way I'll definitely not be doing any pottering for a while! Oh its nasty today I went to next town and there is lot of flooded roads and ponds and streams overflowing too. I saw Virginia in the grocery store and she said the ponies frogs are rotting from so much mud. Every time we get rain its inches of rain. Omg fires in California are bad they need rain. A whole town called PARADISE burned to the ground. Ohh yes as good as they are sometimes the halos do fall. One extreme to another isn't it?! !